I am Mary Treacy founder and editor of the Age Well web site and this is the November 2011 issue of our monthly Newsletter. In the difficult period the world is going through at the moment, with social unrest, natural disasters, extensive economic migration and chaos in the financial markets, we all need some positive news. Bearing this in mind, the overall theme of this issue is positive thinking and we have started a New Section on Self Development which will include all the new articles about Positive Thinking, as well as other related issues. I hope you will enjoy this section as much as we are enjoying writing it. This month I'd like to introduce to you Jennifer Sophia Catalano who wrote for age-well.org some years ago and has recently rejoined us. We are delighted that Jennifer is back and look forward to her contribution, which starts with this article on Pet Therapy for our new self-development section. When thinking about the overall focus of this website and newsletter - the Promotion of Healthy Aging – one overwhelming piece of news this month is that the world population has just reached 7 billion. News about a ten minute treatment that can Stop Snoring Problems will be welcome news for sufferers - either snorers or their loved ones. One of the most exciting new trends in the media in the last few days has been reports about Natural Orifice Surgery, which promises less pain, no external scarring and an early recovery. Another very topical issue is the invention of a new device in the form of a headband that can Diagnose the Type of Stroke a patient is having within minutes. Recent research confirms that Broccoli needs to be eaten raw or lightly cooked in order to get their full cancer preventing benefits and that supplements can’t replace the real thing. Did you know that, in adition to rejuvenating the body, Sleeping and Relaxing Help Us Lose Weight? Should You Pay Attention to Expiration Dates? - Learn about decoding jargon on food labels especially Expiry Dates and when you should throw out your perishable foodstuffs. World Diabetes Day on 14 November 2011 aims to promote awareness about the disease its complications and how to prevent it. World Day for Chronic Obstructive Pulmonary Disease or World COPD Day will be celebrated on 15th November. Go Green as you clean - 7 cleaning tips which don't polute the environment. Healthy Eating on a Budget - 5 tips for eating well without breaking the bank. This month we are launching a new section on Self Development Issues It will include articles on the spiritual side of our being and issues of a more psychological nature, including the prevention and treatment of illnesses like depression which affect our mood, and articles on the pursuit of happiness. We will continue to build this section in the coming months to include such subjects as social skills, creativity. etc. This is a great piece on Snoring - How to Prevent It. Read about the New Food Plate Logo introduced by the US Department of Agriculture to replace the Food Pyramid in July 2011. The Weight Conversion Chart and Height to Weight Ratio Charts. The subject of Natural Orifice Surgery deserves its own page as it most surely is the way of the future. 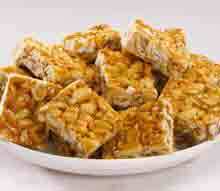 Each month we feature one of the recipes which has been added to our healthy recipes database. This month's choice by Sue from New York is a godsend for busy Mums who need a healthy snack for their energetic offspring. Please don't offer these to your childrens playmates unless you are sure they tolerate peanuts. 1. Grind all ingredients, except for the honey, in a food processor until fairly fine but still having some texture (you don't want it to have the consistency of peanut butter). 2. Add honey and process just long enough for it to blend in. 3. Press into a square about 3/4-inch thick on a plate or square pan and refrigerate for about an hour or more. 4. Cut into 2-inch squares. To find and share recipes for healthy meals of all types the Recipe Database Entry Page. Age-well.org has an interactive section which comprises a series of forums, where you can submit your own news items for possible inclusion in this newsletter or exchange views with other readers on a variety of issue, such as osteoporosis and its treatments and share weight loss strategies or beauty tips. Highlighted here are some great tips and opinions contributed by some of our readers. In the Weight Loss Forum, Jose advocates walking for losing weight and staying young. Please visit our Age-well Forums to join in. We hope you will enjoy this issue. Please feel free to send us your comments , reactions, criticisms and suggestions, so that this news bulletin will evolve over time and fulfill the needs and wishes of our readers. If you have an article you would like to contribute, please read our guidelines for authors and submit your article here. And if someone has forwarded this newsletter to you and you'd like to receive it on a monthly basis, please fill out this Opt-in Form knowing that we have a very strict anti-spam policy and will never pass on your contact details to a third party or send you spam. Keep well till next time.